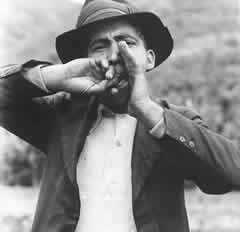 On the Canarian Island of Gomera the whistling language El Silbo is still used. Shepherds communicate by El Silbo over long distances even over the deep canyons of the island. The whistling language does not make use of a code like that of the Morse code. It transforms Spanish into a sequence of whistling sounds of discrete pitches, duration and dynamics. Further information about El Silbo, there too included a linguistic analysis.